Native to woodlands in the eastern United States, passionflower is known locally as "maypop" and was used by many Native American people for swellings, fungal infections, and as a blood tonic. Today it is generally regarded as a sedative and used for problems ranging from hyperactivity in children to the tremors of Parkinson’s disease. Passion Flower slows the pulse and sedates. The herb is also antispasmodic and can lessen nerve pain, painful menses and headaches. Passion Flower is best used for treating nervous restlessness and insomnia. 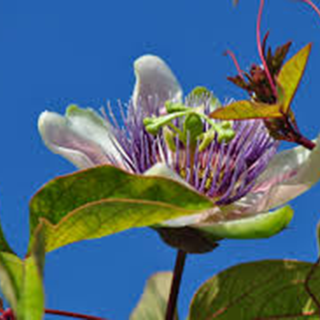 For light sleepers, and if there is a tendency towards bad dreams, passionflower will deepen the sleep. Drink 1 cup made from equal amounts of passionflower and raspberry leaf (1 tsp each) twice daily for period pain. For insomnia, take 1/2–1 cup of an infusion made from 1/2 tsp of dried passionflower to 1 cup of boiling water infused for 15 minutes, at night. For period pain or tension headaches, take 3 times daily; reduced doses are suitable for hyperactivity in children. Take 40–80 drops (2–4ml) in water 3 times daily for nervous tension, high blood pressure associated with nervous stress, or to reduce the severity of attacks in Ménière’s disease. Take up to 40 drops (2ml) in water twice a day to ease the pain associated with shingles and toothache. Take 1–2 x 200mg tablets or capsules night and morning for anxiety, tension, and nervous headaches. Prefers poor, sandy soil that is slightly acid. Sow the seeds at 64–70F (18–21C) in trays in spring and transplant to 3in (7.5cm) pots when large enough. Plant in final growing positions when well established in summer. Alternatively, take semi-ripe cuttings in summer. Shelter the plants from cold, wet winds in winter. Collect aerial parts when flowering or in fruit.